Samsung has launched the Exynos Modem 5100, which is based on the 5G specifications agreed upon by the Third Generation Partnership Project (3GPP). Samsung 5G modem gives the South Korean firm a substantial head start over arch-rival Apple, which for now doesn’t have this part. Samsung 5G modem – what to expect? Samsung believes that the capacity of the 5G technology to transfer large-capacity data and real-time low-latency communication would ensure a better user experience in areas such as the Internet of Things (IoT), ultra-high resolution videos, real-time artificial intelligence, hologram and autonomous driving. Designed on the 10nm process technology, the chip also offers legacy radio support. The Exynos modem supports the radio frequency IC (RFIC), Envelope Tracking (ET) and power management IC (PMIC) solutions. Reportedly, the Samsung 5G modem can deliver throughput up to 3Gbps, when powered by sub-6GHz mode and a maximum of 6Gbps when using mmWave networks. 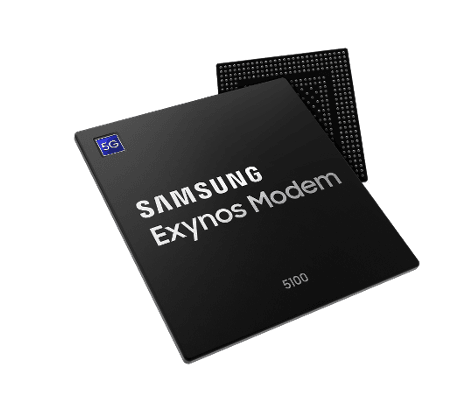 Samsung Exynos Modem 5100 is also compatible with other modern standards such as 2G GSM and CDMA to 4G. This is done to ensure a smooth transition between the existing LTE infrastructure and upcoming 5G network. Samsung 5G modem support for these standards suggests that LTE is here to stay longer even after the arrival of the 5G, and would form the base for the carriers’ network for some time. Apple, on the other hand, has likely outsourced the 5G modems for its iPhones. Most likely Intel and Qualcomm would manufacture Apple’s 5G modems. The Cupertino, California-based company, however, would not be the only company to rely on Qualcomm for its modem needs. Even Samsung might deploy Qualcomm modems in its 5G phones that would sit on next-gen Qualcomm processors, such as Snapdragon 855. According to Dr. Inyup Kang, president and head of System LSI Business at Samsung Electronics, Samsung’s leadership status in communication technologies and market-proven knowledge allowed it to develop the first 5G modem which complies with all the standards. “As the industry prepares the shift toward 5G, Samsung will continue to drive the growth of innovative ideas and new services in mobile applications and other emerging industries,” Kang said in a statement. As of now, there is no information on when the Samsung 5G modem kit will launch, but the company expects Exynos Modem 5100 to go live in the consumer devices before the end of 2018. The upcoming Galaxy S10 won’t come with the 5G mode, but Samsung might integrate the Exynos Modem 5100 with its next-generation Exynos chips. Samsung has already conducted the over-the-air (OTA) 5G-NR data call test under a wireless environment by deploying the 5G base station and 5G end-user equipment prototype linked with Exynos Modem 5100. The test was done under the real-world like cellular network conditions to ensure the development and commercialization of 5G mobile devices that would run on the new modem. Additionally, Samsung has joined hands with various global mobile carriers and partners to launch the 5G mobile communications to the market as soon as possible. Can Exynos Modem 5100 help Samsung win contracts? South Korea is making efforts to become the first nation to launch the 5G network. This is attracting suppliers from across the world to get contracts for switches and other gears required for completing the network. With Exynos Modem 5100, Samsung may win some contracts, but the rising competition may prove a setback. Huawei has emerged as the largest network gear maker, and is making strides in the 5G technology as well. The company is also investing in research, and has become one of the biggest holders of patents. Meanwhile, Samsung recently unveiled the Galaxy Note 9. Samsung’s Note 9 is aimed at the high-end users along with the loyal iPhone X users. The Galaxy Note 9 comes with a massive screen and high-end specs to complement its premium price tag. The company hopes that the Note 9 will attract the iPhone users, along with boosting sales. Samsung’s latest flagship would be available in two versions – 128GB internal storage and 512GB storage (twice that of the iPhone X). The 128 GB version is priced at $999.99, whereas the bigger one commands $1,249.99, more expensive than the high-end iPhone X.
Samsung is relying on the Note 9 and its upcoming series of smartphones to turn around its struggling smartphone unit. Operating profit of the unit has depleted in the second quarter owing to the rising competition from the Chinese smartphone manufacturers.